Many Sebians contact me that they want a sweet snack. This one will soothe your taste buds and give you something to think about when eating healthy daily. 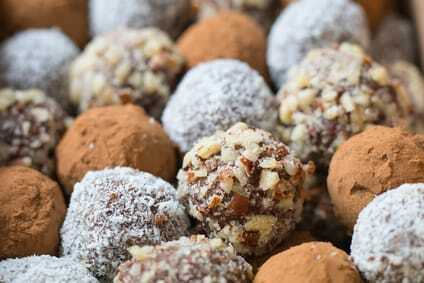 You can see the photo on the left and the recipe is about the nut balls only. You can however roll the falls in differnent approved powders if you like. Put sesame seeds, figs, greens powder, and salt in food processor and process until they reach a sticky consistency. Scoop into another mixing bowl. Process brazil nuts and walnuts until fine but crumbly, and add to mixing bowl with the above mix. Add hemp hearts and dried fruit to mixing bowl and mix thoroughly. Mixture will be thick and stick so will be easiest to combine with hands. Add in the coconut at the end. Roll into 1-2 inch balls. Store in airtight container in fridge. Will keep for up to 2 weeks. You will find that one is never enough. They will make perfect mid morning and mid afternoon snacks. Careful…they get addicting.